Are you experiencing pain in your stomach? Do you feel pain in your stomach once you have your food? If you answer these questions in the affirmative then you must know that you might be suffering from Duodenal Ulcer. Now, what is duodenal ulcer you might ask? 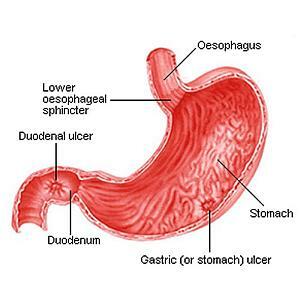 Duodenal Ulcer is the inflammation of the Duodenum. The duodenum is the proximal portion of the intestine. This duodenum is 12 finger-breadths long and is located just below the lower end of the stomach. It plays a vital role in the process of digestion. However, you don’t need to worry if you are suffering from duodenal ulcer as there are many Ayurvedic treatments that help you to get rid of this ulcer. Before moving on to the treatments, it will be better if we take a look at what exactly happens in duodenal ulcer. Duodenal ulcer is the ulcer of the duodenum. The main symptom of duodenal ulcer is chronic pain. It occurs mostly when a person feels hungry but vanishes when the person consumes some food. However, in majority cases, the pain persists even if the person consumes food. As this ulcer affects the process of digestion, the person starts losing weight as there is lack of absorption of vital constituents from the food. The person suffering from duodenal ulcer also experiences excruciating pain. In some cases, as the blood has to pass through the intestines, it also leads to bleeding. A person suffering from duodenal ulcer may also see blood in the stools. However, this is mostly evident in extreme cases and is quite rare. Spicy foods are the main causes of duodenal ulcers. Apart from these stress and anxiety are also the primary causes behind a person developing duodenal ulcers. Thus, to get rid of duodenal ulcers, you need to stay away from activities that lead to stress as it is the number one cause of duodenal ulcers. The nature of duodenal ulcer is such that it can be treated with little or no treatment. However, the most effective treatment for duodenal ulcer is the Sukumara Ghrita, which includes ghee and castor oil. A person suffering from duodenal ulcer needs to consume this ghee with milk. If the person is allergic to milk, then the ghee can also be consumed by mixing it in warm water. While taking these medications, the person needs to stay away from foods such as pulses and should not include food that leads to dryness and roughness in the body. Also, fried and spicy foods should be also avoided if a person wants to get rid of duodenal ulcer effectively. Food such as wheat, ghee, cheese and milk should be included in the diet of the person suffering from duodenal ulcer. Initially, a person suffering from duodenal ulcer needs to consume 1tsp of ghee with warm milk. The person needs to increase this intake gradually. Once the person is used to this intake of ghee, then he/she can consume a mixture of teaspoonful of ghee with warm milk. To reduce the pain arising out of the duodenal ulcer, the person needs to consume the Shankha Bhasma which includes a mixture of conch shell ash which is obtained from seas and oceans, water and lemon juice and Aloe Vera. This mixture helps to improve the process of digestion and reduces the pain experienced by person caused due to duodenal ulcer. This mixture should be taken in a cup of warm water 2-4 times a day. I am suffering from duodenal ulcer and want to know the dosage of consuming sal bhaskar satt. Do i need to observe any diet restrictions during the course. I have been given some powders mixed with dhania (coriander powder)and khadi sugar powder I have been told to get this medicine. but the charges are high if i take from him. I am purchasing outside. I am suffering from deoudenum ulcer.what i do?please suggest me. please suggest me some ayurvedic medicine for deoudenal ulcers. i’m suffering from meals gastrict and dudenal ulcer 1st part.please suggest me ayurvedic medicine. Sir My father is suffuring with ulcer from last 1 month & he was also treated through antibaiotic but hence he is not recovery from stomach pain as yet. 2 years back I am suffering from duodenal ulcer,after taking allopathic treatment i was quite OK.again I done endoscopye there was no any ulcer found in the stomach the ulcer is totally cured.then doctor said u can stop the medicine and I do.after one year till I feel OK and I totally avoid the spicy,junk,hut outside food.but now three four days my stomach is paining light burning Continuously.kindly suggest the right medicine to cure ulcer completely. I am suffering from amobic colitis plus accute constipation. And worms infestation. Pls. Sujjest medicine. I’m 69yrs of age and purely vegetarian.